These radio dramas have been heard on the radio for over forty years and are currently on over 400 stations. They are a collection of 30-minute dramas adapted from all of the major Bible Stories, true stories from history, and powerfully effective character building stories which teach children Christian values. You are getting one FREE! Or, buy individual volumes as priced in the following product frames below. The Bible comes alive with these 24 stories (12 CDs) from Adam & Eve and the story of creation and man’s fall through Moses leading the Israelites from Egypt and the parting of the Red Sea. Album 2 picks up with the Israelites wandering in the wilderness for 40 years and the Ten Commandments given to Moses through the story of David and Goliath, David escaping from King Saul, and Nabal. Album 3 picks up and continues the kingdom of Saul, the kingdom of David, the kingdom of Solomon, the divided kingdom, Elizah and Elisha, Hezekiah, and Mordecai and Queen Esther. Continues with the story of Queen Esther saving her people, the story of Job, Daniel and the Babylonian captivity and Nebuchadnezzar, and the story of Jonah. The New Testament stories begin in the middle of volume 4 with the story of the angel Gabriel appearing to Mary, the birth of Jesus through Jesus walking on Water and feeding the 5,000. Enjoy 24 stories that will building character in your children. There is no special order to these stories, but you'll want to listen to them all with your children at home or in the car. 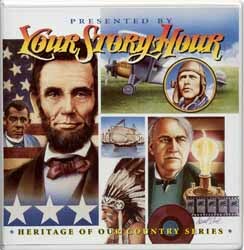 Continue with true stories that will warm your heart and teach character to your children. The character trait taught in each story is given in the list of titles. More true character building stories teach character traits such as obedience, honesty and true friendship, resisting temptation, respect for others, kindness to pets, principles of freedom, God's care, telling the truth, concern for others, and so much more. Each story is a treasure and one your children will want to listen to over and over. The last of the character building series. More true stories teaching such traits as faithfulness and bravery, respect for the elderly, recognizing God's protection, love for God's Word, courtesy, neatness and thriftiness, unselfish love. My favorite story in this series is "The Long Train Ride," the story of God answering the prayers of two war orphans. You'll never tire of listening to this treasure chest of stories that will warm your heart and building character in your children.